Tehama County River Park is located approximately 10 miles east of Interstate 5 on South Avenue in Corning. 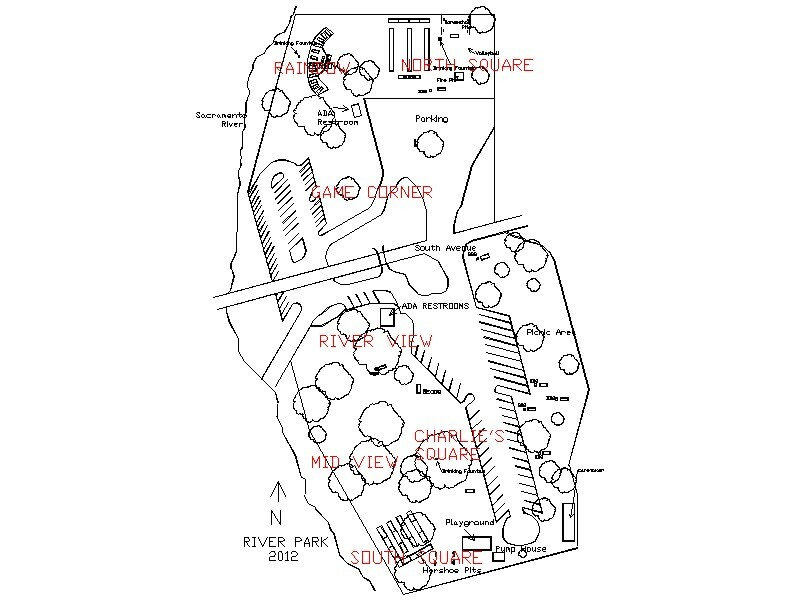 The park is approximately 14 acres and is situated along the eastern bank of the Sacramento River at Woodson Bridge. The park has river access via a public BOAT RAMP with ample daily vehicle and boat trailer parking. There is no overnight parking or camping allowed within the park. The park is divided by South Avenue. There are driveways that access both sides of the park as well as a pedestrian tunnel under South Avenue to allow foot access between the two sides. SOUTH SIDE- 4 picnic areas can be reserved: CHARLIE SQUARE has 8 picnic tables, a food prep table and 2 small BBQ grills; MID VIEW has 6 picnic tables, a food prep table and 2 small BBQ grills; RIVER VIEW is ADA accessible, has 16 picnic tables, a food prep table and 2 group and 1 small BBQ grill. SOUTH SQUARE is ADA accessible, is the largest picnic area in the park and can accommodate over 200 people with 25 picnic tables, 2 food prep tables, 2 large and 1 small BBQ grills. South Square is located next to the PLAYGROUND area and near the HORSESHOE PITS. This side also has ADA compliant restrooms and parking.